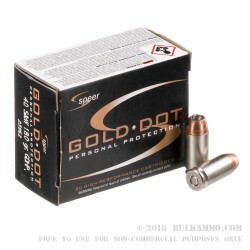 Speer Gold Dot 40SW ammo has a reputation that precedes it. 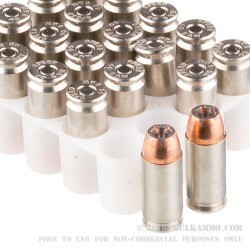 It is known the world over as a potent duty round across the entire lineup of calibers. This 180 grain .40 cal is no exception. 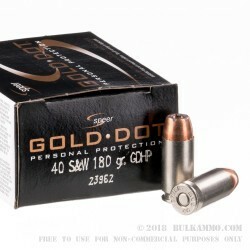 The proven Gold Dot projectile is a uniformly expanding, hard hitting bullet and the ballistics behind this one are finely tuned to give maximum uniformity and weight retention upon impact. This load offers 1025 feet per second of muzzle velocity and 415 ft. lbs. of energy at the muzzle ensuring that you have the potent knockdown, threat stopping potential that is inherent to the .40 S&W cartridge. 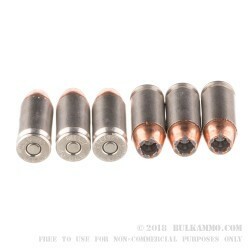 With the jacketed bonded hollow point, the weight retention on the projectile and the lack of fouling, combine for an easy to love cartridge that has fans everywhere in the law enforcement community. Nickel plated Boxer primed brass give added feeding and extraction benefits and helps in the ease of reloading. The already proven reliability of the Gold Dot line and the engineering of this particular projectile means you can rest assured when you need to count on your ammunition, it is ready to perform. Suitable for use in any .40S&W mainstream firearm. Q: How does this compare to the Winchester JHP's? Thanks guys!! A: Both these Speer Gold Dot 180gr bonded hollow points and the Winchester 180 gr bonded hollow points offer excellent penetration and expansion in soft tissue, even after passing through barriers such as auto glass, wallboard, or steel. Q: Does the nickel plating make a differance in the performance of the round or is it just a different coloring for the rounds? A: The nickel plating has a little more inherent lubricity than standard brass cases, which helps feeding. Also, corrosion resistance is increased.